[T]he United States, in its confrontation with China, has at least three lines of strategic deterrence located all over the Pacific Ocean. The first is in close proximity to the Chinese territory, based on U.S. military bases and infrastructure on the Japanese archipelago, in South Korea, Okinawa and Taiwan. Intense negotiations are taking place on re-establishing the US naval base in Subic Bay in the Philippines. It has been confirmed that the U.S. and Vietnam have begun informal talks on leasing the former U.S. military base in Cam Ranh. The southern transit route, which runs through the strategically important Strait of Malacca, is vital for China. If it were closed, China’s economy would not be able to survive even for a month. That is why the U.S. created a permanent group of warships that will be located in Singapore. Strategic depth will be provided by the U.S. military in Australia and the Philippines. Thus, the strait can easily be blocked by Washington. The formation of an anti-China coalition consisting of the USA, Russia, India, Japan, South Korea, Australia and Southeast Asia could put China in a desperate situation. Apparently, with the Cold War over, a new global confrontation between the United States and China could begin. One might get this impression after analyzing the steps taken by Washington in the international arena. For now, America is avoiding making any declarations towards China, such as the Truman or Eisenhower doctrines or Churchill’s Fulton speech. However, practical steps to curb Beijing have already been taken. The U.S. has been consolidating its power in Australia and Singapore, and there are plans to begin military assistance to countries in the Asia-Pacific region. From discussing the problem with American experts working on military issues, it becomes clear that today the United States, in its confrontation with China, has at least three lines of strategic deterrence located all over the Pacific Ocean. The first is in close proximity to the Chinese territory, based on U.S. military bases and infrastructure on the Japanese archipelago, in South Korea, Okinawa and Taiwan. Intense negotiations are taking place on re-establishing the US naval base in Subic Bay in the Philippines. It has been confirmed that the U.S. and Vietnam have begun informal talks on leasing the former U.S. military base in Cam Ranh. If you draw a line between all these states, you will see the first circle of the U.S. containment of China, which effectively prevents the country from being a maritime power. Today, the Chinese navy’s access to open water is controlled by Americans. However, there is also a second circle (based on Guam and Hawaii), as well as a third, reserve one, the base for which is California and Alaska. 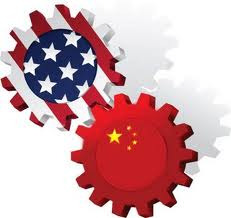 According to a source close to the White House, China is now clearly perceived by the American political establishment as the most important threat to U.S. interests in the long run, so Washington believes it is advisable to start to control China today. The United States is not going to control China alone. It is actively trying to recruit as many allies as possible. These can be divided into several groups. The first is composed of countries that are heavily dependent on the U.S.: Japan (in military terms, the country is more an American satellite rather than an ally), South Korea (which without military aid from Washington risks a showdown with North Korea), and Taiwan (an unrecognized state that remains de facto independent only with the support of the U.S.). Tokyo, Seoul and Taipei will support any initiatives from the White House directed against China. The situation is more complicated with other international actors. The United States, in trying to contain China, has set up a system allowing it to deprive the Chinese economy of energy commodities at any time. To implement this, it is important to shut the northern and southern transit routes, according to the abovementioned expert close to Barack Obama’s administration. The situation is somewhat more complicated with the northern transit route, Russia. According to available information, for the past few months the United States has been waging an intense campaign of negotiations with Moscow, trying to obtain its support on the issue of containing China. They have so far been unsuccessful. In order to achieve a positive outcome, the U.S. is willing to make some concessions to Russia, including on missile defense and financial and economic issues. In Washington, they are well aware that Russian support may be the decisive factor in dictating terms to China. That is why they intend to continue to move in this direction. Simultaneously, the U.S. continues to hold an anti-China dialogue with India. In recent years, Sino-Indian relations have not been so bad, but in the past significant differences have arisen between Beijing and New Delhi. That is why the participation of India in containing China does not seem improbable. The formation of an anti-China coalition consisting of the USA, Russia, India, Japan, South Korea, Australia and Southeast Asia could put China in a desperate situation. The Chinese government is well aware of this and is trying to find a way out by creating a powerful fleet capable of operating far beyond the Chinese coast for a long period of time and that could directly threaten the United States, as well as by strengthening relations with Russia, which does not want to contain China. This is one of the reasons for the Chinese media’s attempts to project the idea of a Russian-Chinese Eurasian alliance, which could in fact be a tool for balancing U.S. influence in Eurasia. It is not yet clear how far Washington is ready to go in its anti-China strategy. But the signals coming from the White House are raising some concerns. That is why international relations in the second decade of the 21st century may see the reappearance of the doctrines of “containment”, “liberation” and “massive retaliation”, concepts that were thought to have been long forgotten.